Ninety-five passengers have been taken to city hospitals and about a third of them are in serious condition, according to an emergency services official. A derailment of coaches on the Moscow metro on Tuesday morning resulted in 21 deaths and more than a hundred people suffering injuries. Carriages on the busy Arbatsko-Pokrovskaya dark blue Metro line derailed, after what was believed to be a sudden failure in the electricity supply to a conductor rail. According to RT.com, about seven people are believed to be trapped in one of the train carriages. Attempts are being made to try and evacuate the stricken passengers, who are stuck in a tunnel between Park Pobedy and Slavyansky Bulvar stations, in the west of Moscow, the website added. RT cited Moscow’s emergencies agency press service as saying the train derailed because it had to brake too suddenly. Ninety-five passengers have been taken to city hospitals and about a third of them are in serious condition, according to an emergency services official. Over 60 medical teams and ambulance helicopters are working at the site of the accident. About 200 people have been evacuated from the metro. Moscow emergency situations department spokesman Viktor Biryukov said earlier that an eyewitness reported sudden braking of a train on the Slavyansky Boulevard - Park Pobedy stretch at 8:39 a.m. Firemen arrived at the scene at 8:45 a.m.
A criminal inquiry is pending into the accident, Russian Investigative Committee spokesman Vladimir Markin told Interfax. "Detectives are working at the accident scene. A criminal inquiry is pending. A number of tests will be done to expose the causes of the accident," Markin said. Services on many lines of the metro have slowed down as the rescue operations continue. The Moscow Metro, one of the largest in the world, has a good safety record. Last year, thousands of passengers had to be evacuated and dozens needed medical help after a fire broke out in metro. 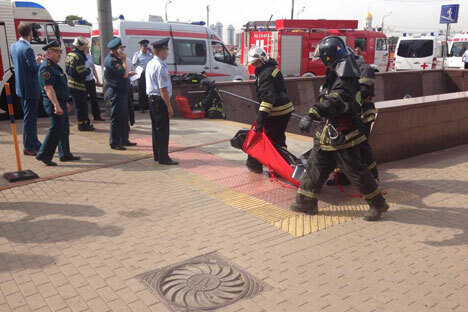 Moscow authorities denied reports of smoke emerging on the affected line today.